Pawoot Pongvitayapanu or “Pom” studying for 1st master’s degree from Assumption University in the Internet & E-Commerce for the 2nd master’s degree at Sasin Graduate Institute of Business & Administration of Chulalongkorn University collaboration of Northwestern University’s Kellogg School of Management, the University of Pennsylvania’s Wharton School. And an undergraduate degree from Rangsit University Faculty of Architecture. Expert in Digital technology & Marketing, E-Commerce. He came from Kanchanaburi Province, Tha-Maka district. Lo-Heng-Mong Group is his family business consist of many business such as motorcycle dealers, Real estate, Car and Track Dealer, Lending service and more. His childhood was like reading comics and playing computer games very much (RPG game Dragon Quest and Final Fantasy). Get money from local Venture Capital name Mono Technology (SET : MONO). Total investment 3 million baht (100,000 USD) Start expand business to 12 people. But he started full time work with Hutchison Wireless – HUTCH (Mobile Operator) and run TARAD.com as part-time job. TARAD.com facing very bad situation, He decided to resigned from Hutch and get back to run and operate TARAD.com full time. And start diversified business to Internet Hosting, Education (Books Publishing and Seminar), Online Agencies, And Online Payment. Expand Team to 70 people and business to grow dramatically. Gen 4. – 2009-2015 (“Join Global” – Learning from Oversea). TARAD.com Join the Rakuten Group, The largest E-Commerce company in Japan. Start new cultural adjustment to the regulatory system. The clear work An eye-opening to global markets. Online E-Commerce goes with Rakuten but other Company run separately in several companies such as Winter Egency (Online Agency), Zocial Inc (Social Big Data), Pay Solutions (Payment), RedRank (Search and Media), Compare.asia (Price Comparison). All company run under “efrastructure Group” All teams in the group together more than 200 lives. Gen 5. – 2015 – Present (“Regional” – Create foundation and Jump to Global Market). The growth of the group efrastructure. All company running as group synergy. 2010 – “the influential New Twitter Influencer” by the magazine GM BIZ. 2010 – “inspired 10 new business” section of the channel ThaiPBS. 2012 – Goody Awards Si Kan year 2555 by the Association for Social Welfare Pier Tha Maka district, Kanchanaburi province. 2012- 1 in 20 people who aspired to the magazine GM. 2012 – Best Startup Pitch: THUNDERBIRD SOUTHEAST ASIA PRIVATE EQUITY CONFERENCE, Vietnam. 2013 – Software Park Thailand Hall of Inspiration Award. 2015 – ELLE Men Top 40 Year 2015. 2016 – Awarded the “Global E-Commerce Innovation Leader of the Year 2015-2016” by IECIA (International E-Commerce Innovation Association) in the ‘Global E-Commerce Innovation Best Person & Company of the Year Awards Ceremony and Summit Forum Shanghai 2016’. 2016 – Award for Executive of the Year in 2559 by the Foundation for Thailand. 2018 – Has been voted one of the Most Active Tech Startup Angle Investor in Thailand by Techsauce. 2011 – Hutch (Campaign Mobile CDMA). 2012 – Lenovo ThinkPad has chosen to introduce Notebook ThinkPad X230. 2013 – Toyota Fortuner is the band’s Music VDO WhatChaRaWaLee. 2015 – Air Asia Project “toured weekdays”. Details of the work of Pawoot each year.! While studying. Faculty of Architecture Rangsit University Pawoot introduced using computer and 3D in the 1st person in Faculty.His Thesis project is “Hua Lum Phong Transit Mall”. Project has been introduced into use in computer design. This year is the first year the faculty. Allow the computer to use the work submitted. He project have brought to show in Thailand Largest Architects Event within that year. During this time the opportunity to work in groups of Shinawatra made by the Internet Corporation of AD Venture (www.Shinee.com) served by Webmaster and Business Development responsible for the B2B website of the group. (Www.ADVhub.com) During this work Pawoot have joined the Thai Webmaster Club, a group of people gathered around the web. By the touch And assisting the club Are always coming and this year Pawoot have to study. 1st Master Degree in Internet & E-Commerce at Assumption University (ABAC) by working with and learning with. Pawoot was involved in the drafting and pushing Thai Webmaster Club and Kick-off and founded Thai Webmaster Association . To extend the theme of the work of the club. And this year is the year Group of Companies Mono Technology The market has entered a joint venture with Com Ltd. to expand the service out. After negotiations had to agree to do business together for over one year (beginning negotiations with the Jasamin Telecom Group, but later had to change his name to MONO technology) through the joint venture, TARAD.com Business is expanding to more and more companies are moving to the Ratchada Tower Building from CMIC Tower Asoke-Sukhumvit. In the same year Pawoot has joined the company or Hutch Hutchison CAT Wireless Multimedia or HUTCH, a subsidiary of the Hong Kong telecom services joint venture with the Communications Authority of Thailand. Open Mobile Brand Hutch by the Assistant Manager: M-Commerce & Portal Oversee the Product & Service for Business (Corporate) by the company marketing dot com. Make friends on the team was supervised by Pawoot take care of the whole of the company. Pawoot was chosen as secretary Webmaster Association Thailand (Thai Webmaster Association) and the activities of the association to work with Hutch and marketing company Com. And also started a guest lecturer on Internet & E-Commerce to various institutions across the country and has been teaching the E-Marketing for institutions Net Design. Pawoot began writing 1st articles. By writing articles about the Mobile Commerce (M-Commerce) to book Micro Computer, and then began writing articles in newspapers Telecom Journal, a publication of the telecommunications of Thailand and the end of 2003 Pawoot decision. Hutch resigned to return to take care of TARAD.com company and began to improve and recover the company. And move from CMIC Tower office building in Asoke to Ratchada area. And start full-operation and growth the business again. Pawoot has begun to expand the services of the website. TARAD.com ThaiSecondhad.com and more, and have the chance to participate and work as a consultant to the. Department of Business Development (DBD) Ministry of Commerce About the E-Commerce to begin writing an article on E-Commerce and E-Marketing more by writing to Bangkok Biz News (KrungThep Thurakij Newspaper), E-Commerce magazines and has launched a website www.pawoot.com The official website is a collection of articles written himself and E-marketing experience within this website. Pawoot get involved with the E-Commerce in Thailand. He gathered a group of entrepreneurs E-Commerce and state and private clubs to be the center of Thailand E-Commerce E-Commerce in Thailand and has been a club president. After four months, clubs have co-founded the “Thai E-Commerce Association“ and had been chosen Vice President of the Association. And year-end, From a Search Engine Marketing Forum in http://www.Pawoot.com. It began as a collection of people who love doing Search Engine Marketing Pawoot has been joined with a group of enthusiasts in this website http://www.SEO.in.th. The goal is Including knowledge of the market by using the Search Engine Marketing, the first in Thailand. Pawoot has been chosen. The personal advisor The governor of Kanchanaburi in the joint plan to improve province’s. He also have passed the training program to Development of Small and Medium Enterprises Business Consulting Enterprises (SMEs) or APEC – IBIZ fourth edition organized by the Department of Industry, together with the National Productivity Institute. To become a Consultant to the SMEs in Thailand, this project is a collaboration among APEC countries or groups. Economic cooperation in Asia-Pacific, 17 countries and start a consulting business full. It has been entrusted to. As a consultant to companies such as the Kasikorn Bank, Rich Monde (Bangkok) etc., and has moved TARAD.com company from Lardprao area to SM Tower Building due to business keep expanding to 40 people. Pawoot began expanding out more. The number of employees in the company’s market-Com expands to 50 more people and to expand its business in many ways, and also as a consultant. National Productivity Institute As a consultant to various companies in the field of e-Commerce and e-Business and e-Commerce has also written out to educate those interested in e-Commerce. And also decide to study in 2nd Master degree at Chulalongkorn University collaboration of Northwestern University’s Kellogg School of Management, the University of Pennsylvania’s Wharton School. To enhance knowledge management. And this year Pawoot opening of another two companies in October, TARAD.Com has expanded to open a new company called TARADnet by a company related to Internet Infrastructure (Hosting, Domain) to accommodate the expansion. e-Commerce business, and this year is the year when many are investing in computer systems Server million baht to expand and enhance the services of TARAD Dot Com and TARADb2b.com company provides wholesale market first. Thailand, which is Thailand The company also received support from the BOI, too, this year has extended to the office. Lertpanya Building (Soi Rang Nam), another to a second office was expanded to accommodate the growing number of employees. Also included expanding the market out to the provinces, and a year TARADedu.com expanded team of eCommerce and eMarketing book and prepare to market the book to Thailand several books. By getting the attention and feedback from the market very well. During this year Pawoot has been invited to be a teacher of Silpakorn University, Faculty of ICT for Thesis Consultant And be sub-group Commerce committee of the SIPA and Institute of Technology, Thailand – Japan. In September Pawoot secretly surprised by proposed girlfriend to married via online (1st person in Thailand do like this). Through the Internet, with thousands of eyewitness drug application vehicles. For the first time in Thailand The Wedding The live online. was the year that Pawoot. Began to invade and expand the E-Commerce solutions using Concept is “3E” including E-Commerce, E-Solution and E-Education advanced to the service provider E-Commerce comprehensive Thailand’s first or. “Abdul E-Commerce” (We have all the answer about E-Commerce), as well as expanding the company to add more. This year Pawoot has written a second book out called “Get rich quick with TARAD.com” and this year the team began a new phenomenon TARADedu.com of the book. The launch of the E-Commerce and E-Business 15 books throughout the year. The publisher of the first to focus on the knowledge of this type. In August Pawoot have the opportunity to study at Kellogg Business School of the Americas, a joint program with Sasin. And a month at the Pawoot have to repurchase from the group MONO to make Pawoot holds 100% of the market, the dot-com and this year Pawoot have the opportunity to write articles for several magazines. Items such as Marketeer, SME Today, SME suggest so rich in October began a plan to form a new company. The market has adjusted and working to open more of the same. In this Pawoot have been negotiating for a joint venture from the TeleInfomedia (Yellow Pages Thailand) Business Directory Business, but negotiations almost succeeded. And come up in the last little bit. Make this deal make knocked Pawoot business decision to continue with determination. However, negotiations Deal Diligent at that time considered building a new business to Pawoot strongly. marks the beginning of the year TARAD.com updated plan of the company under the new concept 3Es but provide a more complete. By launching new TARAD.com version (Version 3) in January. Pawoot invited to a project consultant Feedback Score of the Department of Business Development. Ministry of Commerce In February Pawoot wrote the book “E-Marketing piercing online marketing techniques” in late September. Pawoot TARAD Dot Com has established a joint venture with Rakuten (www.Rakuten.co.jp) E-Commerce Site is one of Japan’s and the world’s eighth largest website to enhance E-Commerce of Thailand to grow. Along with that announcement “We will revolutionize the E-Commerce of Thailand” and have another company named TARAD Solution worked out the Digital Media and Strategy and Development project site. And was invited to be the guest speaker at the E-Marketing or online marketing to institutions and organizations as much as possible to join the working group to prepare recommendations concerning the electronic transaction. In Information Technology Subcommittee of the Senate and December this year, had an opportunity to become a professor at the university course on Digital Marketing. This year is the year Pawoot was very happy he got first child (Nong Pep) on April 9 (He also did live broadcast while his baby born) and graduated with a master’s degree from SASIN institutions in July and is. The use of Twitter as a communication tool and really studied Social Network Marketing business to adopt fully. This year, moved its headquarters from the building at SM Tower (Sanam-Pao) moved to its own building, “TARAD.com Building” in Ratchada Area. The building is a six-storey building itself, and on the 9th. February 2010 TARAD.com announced the launch of Premium Mall (http://premium.tarad.com) Web shopping mall within the new TARAD.com to revolutionize the E-Commerce of Thailand in February (Rakuten Model). 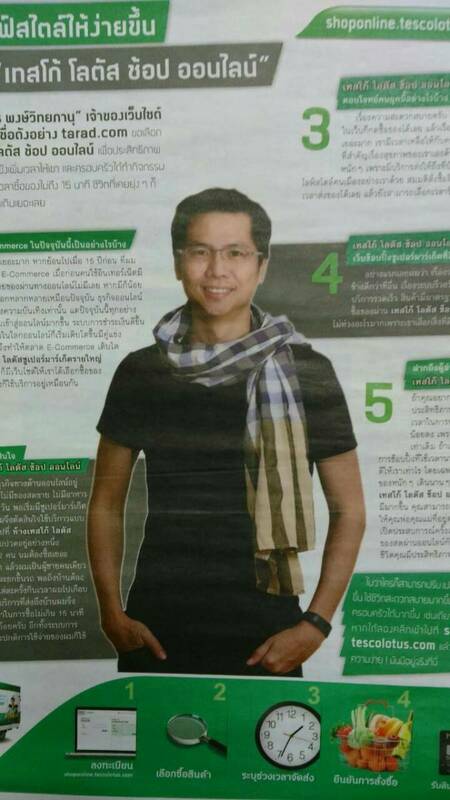 Had a chance to go out and cover GM Biz Magazine interviewed, He also own TV Program in Entrepreneur Channel. (Satellite + Cable TV) broadcast nationwide. The list is to educate SMEs in the trade in the online channel. And this month Pawoot decided to LASIC Eyes surgery for nearsightedness is a regular at TRSC in August. Participants have K-SME Care program of Kasikorn Bank by class 13 versions and was invited to teach. Tour operators Tour of several provinces across the country in October has been chosen to go into the business, GM Biz Magazine as the “new breed of influential Twitter Influencer” and in December. Was selected as one in 10 of the book “inspired 10 business generation” of TV channels in Thailand this year to open systems. Premium Mall (Premium Mall) Shopping Mall, the new format. That the concept of the Rakuten Japan to Thailand with one application. The result of the first-year sales growth of nearly 1000% increase in sales, many shops can be several hundred percent. As the first step “Revolutionary E-Commerce of Thailand” The trend is clearly growing. In late Pawoot with Thang Warat (@ thangman22) Development of storage applications. Social-network functions of Thailand as a country. www.ZocialRank.com and www.ZocialEye.com Social Tracking and monitoring (Monitoring) in the online world. The new service For marketers of Thailand And late last year, also made a summary of the network functions sympathizers of Thailand both out. Infographic of the model and the Office of electronic transactions. (ITD), a government organization established to focus on supporting E-Commerce of Thailand was invited as a consultant in organizational development, E-Commerce Thailand. Later this year it has moved Pawoot web http://premium.tarad.com. Shopping online mall Rakuten model from a Web http://www.TARAD.com TARAD.com the same to be. http://www.TARADplaza.com To turn to focus on providing a full online shopping mall. Thailand and urged people shopping online is increasing. Year 2011 has opened a website http://www.ifund.in.th To zero in the middle of the donated money online. The goal opened up a channel for organizations that wish to receive donations online. It has been donated to help flood victims and with the Bank of Thailand received donations for medical equipment. If glistening bow to apostolic worship And October Pawoot have the opportunity to represent the country to talk about E-Commerce in Asia E-Commerce Conference 2011 at Malaysia. This year marks the beginning of a change in behavior, but put the white jersey. A black t-shirt Because feeling Black is better suited to the job than white is not changed by all that much. Uniqlo’s black T-shirt and put it next to where I work. Stage I was wearing a black T-shirt, but go. Pawoot have been approached by the TV channels in the Nation Channel television producer named “Up Kaban” is sharing techniques used to achieve maximum benefit. Began airing the first time on January 16, 2012 and has been an invited. Subcommittee Program management, information science services (SI), National Electronics and Computer Technology Center (NECTEC) selection technology to help in the development of Thailand. And in February Rename the TARAD Solution Online Agency to Winter Egency for Positioning of the more obvious. And in July the company opened Zocial Inc (Zocial M Co., Ltd) from ZocialRank.com services and ZocialEye.com. To serve Analysis visible companies and brands online, and have the opportunity to broaden in several international centers, such as Startup Asia (Singapore and Indonesia) and, Vietnamese perspective on the expansion of Thailand issued. overseas And has joined the Google Business Group (GBG) and is the founder and manager (Manager) of the GBG Thailand and Bangkok Chapter in bringing technology into the business community in Thailand. And were interviewed in “Younger hundred million” broadcast on Channel 9 interview to the source of the initial work. To inspire a new generation to the children and be Presenter of Lenovo ThinkPad has chosen to introduce Notebook ThinkPad X230. July Pawoot launched TARAD.com Mobile Version 3.0 for the growth of 3G phones and more as “the next cell to a channel in Thailand. Internet access and purchase more. Computer usual “and was invited to speak at the 3rd Annual Summit Mobile Payments and Banking Greater Mekong Vietnamese nation. It is the first Vietnamese. And September Pawoot was selected as Key Note Juliette people in Thailand Khun Seuk vs Samurai Startup Pitching (excited) and was chosen from. Carmakers Chevrolet is one of 20 people who inspire the GM magazine October Pawoot have the opportunity to attend THUNDERBIRD SOUTHEAST ASIA PRIVATE EQUITY CONFERENCE A conference of investors in Vietnam. And Award Winning Business Plan (Pitching) is represented by a team from Thailand. (Day trip) and was also selected to represent businessmen from Thailand only to join the International Visitor Leadership Program: A New Beginning: Entrepreneurship and Business Innovation of the government of the United States have joined the 29 businessmen around the world. To see the work of American business and government offices throughout the United States three weeks later, has also been invited to. Lecturer, speaking at the Asia E-Commerce Conference 2012 in Malaysia as the second and Echelon Ignite Bangkok Pawoot joined the business as well as eight people formed the M8 | VC group to provide support for Startup of Thailand in. invest Moreover, given interviews to the Web e27.sg of Singapore and has to be guest speaking at Startup Vietnam and the Vietnamese have been chosen. President of the Association of Electronic Commerce Thailand. Pawoot launch an offensive on the company’s activities Zocial Inc, more has developed a system ZocialEye Monitoring the capture and analysis of the election of the Governor of Bangkok and The Voice Thailand, including The Star in this year and also organizes Thailand Zocial. Award 2013 was awarded to a team with people and businesses that work in Social Media dominant as revealing insights into the behavior of Thailand on the use of Social Media has never been done before. Feedback has been very good in this job. Including a year at the Zocial Inc has expanded its services to countries Indonesia and Malaysia. Pawoot was elected. Electronic Transaction Commission The Committee on Oversight Services on electronic transactions in the country. During these years, he has traveled overseas quite a lot. Have a chance to be a guest speaker at E-Tail Asia Conference on E-Commerce within ASEAN, Singapore and E-Commerce Asia Expo & Conference in Hong Kong and the Speaker spoke at Startup Asia Singapore 2013 also is. Thailand Business representative to speak at APEC – Committee on Trade and Investment 2013 (Indonesia, Medan), and world-class Global Entrepreneurship Summit 2013 at Malaysia. He also won the Software Park Thailand’s Hall of Inspiration 2013 by the Software Park and the Singapore Post was invited to participate as advisors in the advisory council on eCommerce and eFulfilment, and has been invited to be a mentor, advisor (. Mentor) in the Startup many True Incube (Thailand), JDFI (Singapore), including the Chamber of Commerce invited to the ICT Committee of the Council. This year is the first year Nong Pon (the daughter) began attending school. The school ThamaPirak (near home) and as we move house from the alley Boromarajonani 35 he stay almost 20 years ago in this village to Ladawan Ratchapruk-Pinklow. Ratchada – Pinklao and a year Zocial Inc has expanded its business to countries like Malaysia. And on month of December is the month to start marketing TARAD.com LINE stickers issued by the panda out. Which hit the city immediately comes out. Become a channel for the sale of any TARAD.com have a very good channel for them. started the year with a co-author on the way. Sukhothai Thammathirat University Graduate School of Liberal Arts, Science and Technology for Information Management (Technology for Information Managment) with expert instructors, many of you, and also a year when business expansion into areas increasingly are invited. to speak at etail Asia 2014 Singapore (In this 3 sessions of it) and Asia Conference on Social Media, Social Commerce and Mobile Marketing for Insurance Singapore and Retail World Asia 2014 at Singapore. and at Startup Asia Singapore (again) in the period c. – Apr travel to Singapore frequently over six times it’s crazy.! March is the month with the start of the group. e-frastructure group of business Pawoot. Planning services to digital infrastructure of the country. And the other countries in the region spanning TARAD.com, Winter Egency, Zocial Inc, Pay Solutions, RedRank, Thaiware by a Group Company increased by Synergy had a meeting and working together more – in a month. April Pawoot was selected as one of 12 board electronic transactions. A panel of experts from the public and private sectors. The Commission is acting to promote policies and development of electronic transactions, monitoring of business services to electronic transactions. And make recommendations to Cabinet on the electronic transactions of Thailand – In May, Pawoot study towards a doctorate Ph.D.http://www.tip.grad.chula.ac.th/: Department of Technology and Innovation Management (interdisciplinary) University and has held Thailand Zocail Awards 2014 held. By this time the big event than last year. With thousands of people joining it. Pawoot has been a teacher with a master’s degree. Chamber of Commerce and University Degree (four consecutive years), with courses taught at the tear – innovate. The fighting that began late last year. Donna started as an obstacle to family life and my children. I have attended both Saturday – Sunday. The idea that “classes”, but teachers, many different groups of friends that want to stop cheering. Go ahead, ask Everyone will help make the next pass. But the rest is secondary to me.! Thailand’s economy into the Digital Economy has proposed new laws. Will have the opportunity to join the push for. State change Law on Digital Upcoming By working with public sector organizations and associations. (Have I met deputy minister Wisanu Krua-ngam). a great opportunity this year to have the opportunity to write in their own column in the magazine BrandAge Thailand’s leading marketing magazine. I was delighted contemporaries And had a chance to teach online marketing for the BrandAge well. This year the company started restructuring. efrastructure group to more fully Korn Chatikavanij (Ex-Ministry of Finance) invited a consultant company since late 2014, He cam to interview me into his book. And we also do projects together to SELL RICE thru online channel in TARAD.com, We sold more than 10 tons within a few weeks. And have chance Dining with Khun Abhisit (Ex-Priminister), Khun Korn, Khun Dan, and Khun Suharit’s it’s so fun and February have change to work in Radio FM106 News Family by Channel 3 TV held every working day (Mon-Fri) at 17:45 pm. Invited by Earn Panraphee . And had a chance to talk to the children to gather Social Media Monitoring making this industry better come see that we can do it. And I had the opportunity to make dreams come true on. Plug push in the integration of the E-Payment is made by support from. Bank of Thailand We have established the “Thailand E-Payment Club” held on February 4, 2015 and on 15-16 February 2015 at 18:00 with a very good chance. To go out “Thailand Forward” is a list of the NSO. (National Council for Peace and Order) on the air every day during this important issue across all TV channels and radio, a talk with you, Minister. ICT Pornchai and you Earn Panrapee famous newscaster from Channel 3 excitement coming out now. This summary is issued I go out every TV screen across the country and also on the radio again Oh once in a lifetime opportunity like this and have taken Zocial inc joins several partners leading online morning TV Social news ‘ThaiRath TV phenomenon in new forms Morning. In March, the group efrastructure group has held Thailand Digital & E-Business Trend 2015 (TDET) by drilling a seminar on online marketing trends. By joining forces all affiliates are many, including a press conference to launch the group. efrastructure Officially And a joint press conference with the OPT SEA efrastructure group of Japanese companies to invest in Lead Commerce in Singapore to invest in. Comparison.asia (Now compare.asia) and HappyWedding.life in Thailand (at the press conference, I dress the bride with very Fun) also have to participate One case study in the book “Dear to Do” by Korn Chatikavanij Athletic Assoc (former Minister of Finance) has a chance to be a guest speaker at the Retail Congress in Singapore. And to work in Singapore called Last Mile and Fulfillment Asia 2015 by a guest speaker at this event as well. In April, Thailand Zocial Awards 2015 held three times up, which successfully went well. There are thousands of people do it. Also elected to the committee on trade promotion through digital media (Digital Commerce) business promotion Emerging Digital (Digital Entrepreneur) and the promotion of digital content (Digital Content) to propel the work associated with the promotion of the economy. Digital Ministry of ICT to support Digital Economy. May to represent the country to speak at The ASEAN SME Showcase & Conference, the country Malaysia. I am very proud pay.sn opened online payment service via Social Media, and open Asia’s first accept BitCoin. Pawoot have been taken VDO’s Air Asia in the “Travel Weekday” and has represented Blogger of MICE. Story Competition of TCEB and in July Pawoot was approached by a radio FM 101 RR1 held every Wednesday at Radio economic than 11 hours every week. During the month of August Pawoot are key to the push for the integration of the E-Logistics provider of goals to set a club or association. To further support and E-Commerce of Thailand to complete the form. And this month to work as a lecturer for Global Payment Summit in Singapore. September had attended the Master Conference in Malaysia, and has launched a payment service Pay Social social media. We have Ying Ratha (Yaya Ying) as a Presenter, October had the opportunity to work Google APAC PSP Summit 2015 in Singapore in May and November. Has been selected as a speaker at Echelon Thailand 2015 Annual Tech Startup task of Thailand. And have the opportunity to attend courses ABC (Acadamy of Business Creation) themselves as speakers throughout the three years, but in the fourth year of study for more knowledge. I know a lot of new groups. December sharp Pawoot was elected as the Board of Directors approved the draft constitution by bringing the digital medium to reveal pears have the opportunity to work with the masters Meechai Ritchuphan, including a joint dinner. Talking sit next to each post and Pawoot was elected as ELLE Men Top 40 Year 2015 incredible of an unimproved. And this month, the month that the company Zocial Inc at Pawoot established. Has announced its merge company with Thoth Media Online. Not to compete but to expand the market for more robust. In March, the group announced the closure RAKUTEN E-Commerce in ASEAN Pawoot acquisition all night. I managed to take off, then turned to brand name Rakuten TARAD.com full again and adjust the business model to the new model TARAD.com web ThaiSecondhand.com the alarm still goes back up again. In April Pawoot Builk.com announced investment in business administration, construction and construction materials trading business with the private and MillCon Pawoot taxi driver would have the chance to drive the delivery of the night. U Drink I Drive is a new York novelty quite interesting and THECA (Association of Electronic Commerce Thailand) signed an agreement with the Hong Kong Federation of e-Commerce in cooperation between organizations in the plug working pressure. the E-Commerce international (Page out media keypad) and Shippop.com Startup of the transport to the same services begin with. Moshi is fully ready to do business with friends from Rio joint venture with Japan. And has co-founded and may push the E-Logistic Thai clubs are a group of people working on the E-Logistic to make E-Commerce of Thailand has grown together and efrastructure. Announced a technical collaboration between the Faculty of Business Administration. Bangkok. July was awarded the Outstanding Executive of the Year in 2016 from the Foundation for Thai Society. Presented by the Secretary. The Attitude of Kwang Dee is here. He is also the director of the “Giving the Best in Thai Business” initiative. Startup Thailand by GSB is the 3rd year of selection for new generation of children. And this month, Thoth Zocial announced a partnership with Nielson, a leading research company in the world. September had a chance to represent Thailand in APITA and PIKOM meetings in Malaysia. To talk to other countries. In the ASEAN E-Commerce Cooperation and Representing Thailand to speak at the E-Commerce World Summit 2016 in Guangzhou, China, and is the month of establishment. The “Family Council” of the family to plan for the family. To grow in the long run. October was invited by the Malaysian government to speak on the E-Commerce side of SITEC. December was the first marathon run at the Chiang Mai Marathon (normally running only 10 km). During this practice run a lot and was a director at the YWC – Young Webmaster Camp 14 times you are well organized. We have invested in Zort Startup on Invertory Managment. January fly to see the work of the DEF program in Singapore by visiting the office Google and Facebook to prepare all students to study here. And start a new Start Fintech. Creden.co is an online credit scoring system. This is the song KPN Pinklao at school because I have to wait for the piano students themselves do not know what to do. Take a song to kill time. Do not ask me how good it is … And TARAD.com has signed with ASOCIO in the E-Commerce Alliance in Malaysia with other E-Commerce Websites in ASEAN. In February, Thoth Zocial announced a joint venture with OBVOC, an information analysis service provider in Social Media, to be TZO, with a net profit of 35 million baht from GSB and the Stock Exchange of Thailand. April has had the opportunity to travel to Myanmar with friends ABC brought the children to pay homage to God very much, and TARAD.com in cooperation with the Office of Digital Promotion Ministry DE is a channel for entrepreneurs across the country. Selling products online Canton Fair is the world’s largest fair in China, Guangzhou, has ever opened. Selected as Independent Director of the Thai Fintech Association and has been the director of SCB Future Leader Challenge. Stamped in the event offline. This month, we started to help YEC team in Kanchanaburi (new business group in Kanchanaburi province) to make plans and projects of YEC in developing provinces together with government agencies and other agencies. This group has every province. Under the Chamber of Commerce of each province. The advantage of YEC is that it is a new generation. Understand the changes that have taken place. Adapt quickly And can connect with adults. Make it easy to work in the community. In May, the Thailand Zocial Awards 2017 was held for the fifth time that we organized this event. This is the time that Thoth Zocial team has all arranged themselves very well. In June, the DEF course took students to the real school at Google and Facebook. It will be really and also bring OTOP products from Kanchanaburi to the sale at the Thailand Festival together with the Singapore Embassy. I also ran to StarWars Run 10Km in Singapore during the night, very cool. The month is the children. Moved to New School from Thipphiruk School Pinklao House moved to the School of art. This has now been revamped. It is an international mix of Thai. (Pavel’s father ended here). Pepper came in year 3 (Year 4) and entered in year 1 (Year 2). What can I learn from here? This month, Shippop.com Startup Transport has reached an agreement with a Malaysian company to open Shippop Malaysia – Singapore, flying to Kuala Lumpur on a late-night contract. Have a great chance. Representing the e-commerce industry in Thailand, speak to the United Nations or United Nations ESCAP with ITD. Talk about E-Commerce to groups from CLMVT, Cambodia, Laos, Vietnam, Myanmar, and Bhutan. Discuss the international collaboration. And now the Department of Revenue is seeking ways to levy taxes with foreign companies that make income with Thais. I have been following this for a long time, have the opportunity to help counsel. I want the country to have tax money in this section. The E-Commerce Road Map of Thailand, by Pawoot aims to have Thailand’s E-Commerce Board at its disposal. From every governmental agency. It will reduce duplication and move forward. It’s been a long time since I’ve seen it. September was invited by THAI to speak with the board of directors of THAI. Very exciting The President’s attention. And take the advice of the PAWA and invited the Chinese government to represent Thailand to speak at the Belt and Road Summit 2017 in Hong Kong. More than 2,500 people from 40 countries. November Represented Thailand at the eCommerce Crossboarder Conference 2017 in Malaysia and went to Taiwan with ETDA, the Thai government representative at the South East Asia Cross-Border E-commerce Forum and started the second edition of the DEF. The 132 students (with more than 4 applicants) made it to the third edition of the 95 people to be very grateful. That course has received a lot of attention. Finish the history of the Family y Grand Pa in the second generation of Pawoot finished. It is a history of the Archaea that I want to keep for generations. I know what happened in the past generation. He has been accepted as a director of Siam Ratchathani Public Company Limited for his experience in listing the Company. The monkeys started to change from air like. I like computers very much. January moved his office from Ratchadapisek to CW Tower and was voted one of Techsauce’s Most Active Tech Startup Investors in Thailand and went on to attend the Director Accreditation Program (DAP) of Thai Institute of Director (IOD). The course is offered by Sripatum University and IDE to IPO of the Stock Exchange.